Rifle and ammunition – We do not rent or loan out firearms or ammunition. Approximately forty rounds of ammunition are recommended. This will allow enough shots for pre-hunt range shooting to ensure your targeting is precise and your rifle is in working order. Our recommended ammunition is at least .270 and to use big game bullets. Waterproof leather boots with lug soles – You will be hunting on slippery mountainous terrain. If there is snow cover, gaiters are ideal to keep your legs dry below the knee. Weather appropriate clothing – The time of year and the amount of snow fall are determining factors in deciding what to pack for clothing. Once your hunting date is set we will contact you regarding "expected" weather conditions. Binoculars – An essential piece of equipment for hunting is binoculars. They allow you a better view of your potential trophy. Extras – A small camera and back pack will also come in handy. 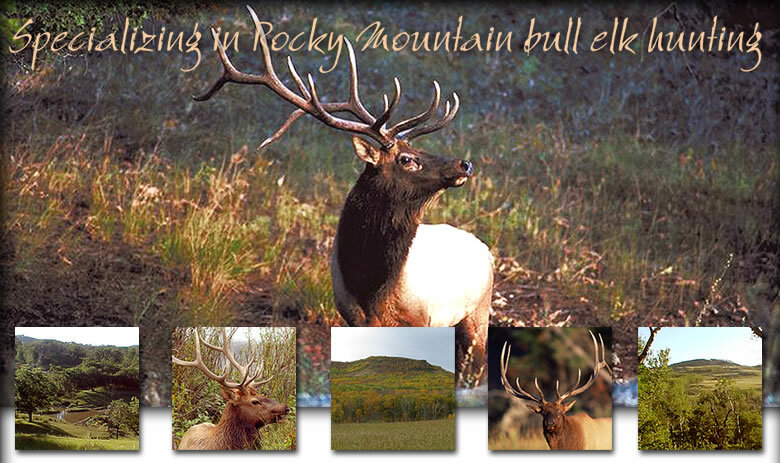 The job of your physically fit guide is to direct you to a trophy elk. You will set the pace for the hunt, based on your physical conditioning. Feel free to ask the guide to slow down or stop. Our goal is to make this a fun experience, not an iron man event. Please inform us ahead of time of any physical limitations or medications which would require special arrangements so we can provide you with proper safety and comfort measures. Our main guide is a trained emergency medical technician (EMT) and our secondary guide is trained in basic first aid and cardiopulmonary resuscitation (CPR). We always strive for a safe and enjoyable hunt! It can be difficult to accurately judge the Safari Club International (SCI) score of an elk at long range or when running through the brush. We do our best to guide you to a high-scoring elk. However, the responsibility to pull the trigger ultimately lies with the hunter. If we are unable to assist you in locating an elk to your liking, you will only be charged the guide fee of $125.00 per day. We enforce the following precautions so you will have a safe and fun hunting trip. Do not hunt with a cartridge in the chamber. There is always time to lock and load. Use a black powder gun, handgun or a bow for your hunt. No smoking is allowed in the preserve due to the forest and tall grass cover. No loaded guns are allowed in the vehicles. No loaded or unloaded guns are allowed in the lodging area.